The first aim of this group is to improve the conservation status of some faunal species in sickish situation, as all are listed under different menace degrees. 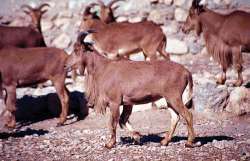 Among them are ungulate of North African distribution so as species from the Iberian Peninsula, some included in its captive breeding program. The final conservation must be accomplished in the species’ original habitats with the aim of reestablishing and long term keeping wild populations healthy from the genetic and demographic points of view, for what this group combines the ex situ with the in situ research. 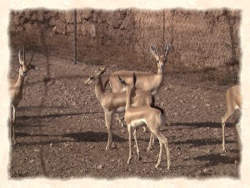 Four species of northafrican menaced ungulates (Mohor Antelope Gazella dama mhorr; Saharawi Dorcas Gazelle Gazella dorcas neglecta, Harmush or Cuvier’s Gazelle Gazella cuvieri and Saharan Barbary Sheep Ammotragus laervia sahariensis) are breeding under their respective captive breeding program in the EEZA’s PRFS for whom Mar Cano has been formerly responsible. 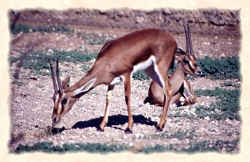 Teresa Abáigar is since 1990 the International Studbook Keeper for the Saharawi Dorcas Gazelle and coordinates its captive breeding program (EEP/EAZA) since 2003, where spanish zoos and institutions (Madrid Zoo-Aquarium, Barcelona Zoo, Zoo-botánico of Jerez de la Frontera, Núcleo Zoológico “Coronel Duyos” (Nueva de Llanes, Asturias), OASYS-Reserva Zoológica del Desierto in Tabernas) so as european ones (Hannover Zoo, Stuttgart Zoo (Germany), Marwell Zoological Park (UK), Zoo Doué-la Fontaine (France) are involved. 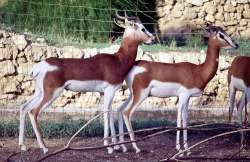 * Evaluation of the status in the wild of the remnant populations of these species, through field surveys in their former distribution areas (Tunisia, Algeria, Morocco, Mauritania and Senegal) in order to determine their present situation (distribution, status and problems for their conservation). Reintroduction’s goal is the establishment of a species in a place where it lived but has disappeared, restoring a population that must be of a genetic and demographic quality enough to assure its long term viability. With G. dama mhorr: In Senegal (Guembeul Special Fauna Reserve, 1984); in Morocco (R’Mila Royal Reserve, 1992) and in Tunisia (Bou-Hedma National Park, 1997). With G. cuvieri: In Tunisia (Boukornine National Park, 1999). With G. dorcas neglecta: In Senegal (Guembeul Special Fauna Reserve, 2007 and Ferlo North Fauna Reserve, 2009). In this project, coordinated from the EEZA (T. Abáigar), participates Barcelona Zoo, Madrid Zoo-aquarium, Jerez de la Frontera Zoo and OASYS-Zoological Reserve of the Desert in Tabernas. This project has received the 2009 Funds for Conservation of the Iberian Association of Zoos and Aquariums (AIZA) and is considered a World Association of Zoos and Aquariums’ (WAZA) “branding project”. Determination of the biological, ecological, social and environmental variables that can accord the survivorship in the wild of menaced species or can restrain their reintroduction projects. Effect of the captive conditions in the reproductive success of individuals and of populations. Genetic and demographic management of small populations.